Wisconsin's Madison College is home to the Automated Manufacturing Systems Training (AMST) Program. Students in the AMST program develop competencies in a wide array of automation areas: system development and control, programming and assembly, troubleshooting and more. AMST, part of the Manufacturing and Engineering Program, comprises a regional, multi-campus education system that is working to close the skills gap in the manufacturing industry. The Wisconsin area, long known as part of the "Rust Belt" is booming with manufacturing opportunities. Manufacturing accounts for the majority of the Wisconsin’s gross domestic product, and in recent years the state has seen a dip in the unemployment rate. Madison College's Manufacturing and Engineering program serves thousands of area students and have graduated over 1300 who have since become employed in the local manufacturing industry. One aspect of the program that has led to great success involves the real-world experience gained from experts in the local manufacturing industry. Madison College and AMST directors went straight to the source to staff program instructors, with many employed locally in Wisconsin's manufacturing firms. Participation in the program enables students to preview potential employers and get a feel for the types of equipment and systems they will be working with, which aids in the development of practical skills and confidence to help them land jobs after graduation. FANUC, Yamaha, and ATI Equipment in the Sub-Zero, Wolf & Cove proof-of-concept. Photos courtesy of Madison College. In 2017, appliance industry leader Sub-Zero, Wolf & Cove called upon the students of AMST to develop and proof an automated system for the assembly of refrigerator components. Students needed to integrate a variety of manual and machine processes into a single work cell that would ultimately produce the unit's base tray subassembly. The subassembly consists of several different components such as compressors, a condenser, the base tray itself, and two different types of fasteners. The students' challenge would be to develop an automated process capable of not only handling the various materials, but also securing them to the tray. As is the case with many academic ventures, funding for the project was limited, and the team was encouraged to utilize existing equipment wherever possible. Fortunately, this included a six-axis FANUC robot, a YAMAHA 3-axis Linear Gantry system, and a 5x10’ work cell within which the students would design their proof-of-concept system. Almost immediately, the students realized they would require different tools to handle the various components in the process. Implementing tool changers would enable this and overcome space constraints to better optimize the payload of the robot. 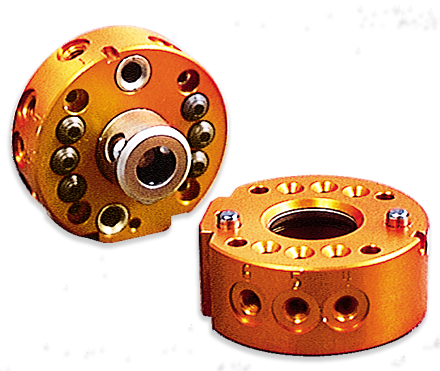 Selecting a tool changer supplier was a cinch. Several AMST students observed ATI Industrial Automation products in real-world applications from Madison-area companies; others had worked with ATI equipment on other projects. The students found the compact design of ATI’s Standard Duty Tool Changers ideal for their limited work envelope. Additionally, ATI Tool Changers integrate easily with any robot—a critical necessity since the students used equipment from different manufacturers in their project. The ATI Tool Changer models deployed in this system included integrated pneumatic ports which helped route utilities efficiently to the tooling. The availability of compatible Tool Stand options for storing end-of-arm tools saved space as well. Benji Dehn, Manufacturing Engineer from Sub-Zero, Wolf & Cove, confirms that the proof-of-concept was a considerable success and spoke fondly of working with the AMST program. He says, "Working with the students was a thrill for our team. We saw tremendous growth in their understanding of automation and controls throughout the project." Sub-Zero, Wolf & Cove sees a future for this application in their plant and will continue to explore options for its implementation. The opportunity for students to work closely with potential employers, and more importantly, to get feedback on their work, is vital to the progress of AMST students. AMST's Program Directors Peter Dettmer and Rick Jacobs sought to create a practical education experience that readied students for employment in their local community. AMST is bridging the manufacturing skills gap in the Madison area by enabling companies to take part in the development of their future employees. As graduates of the AMST program seek job opportunities, they have not only the skills they need to get the job done, but also confidence that their skills are in demand. ATI and the AMST program share the philosophy that education breeds innovation. ATI is elated to be recognized by program participants as an industry standard, and proud to support the AMST Program at Madison College. Booth #4411 - We are showcasing our newest Manual Tool Changer, Force/Torque Sensor, and Universal Compliance Compensator models in a live robotic demonstration! 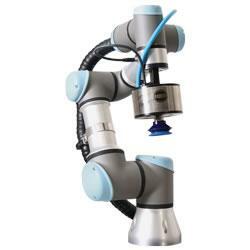 These solutions are ideal for use in collaborative robot applications.